Ravioli are a classic Italian dish from the Regio Emilia region of Northern Italy. They are traditionally made with egg pasta and a meat or vegetable and cheese filling, cut into squares. Since most varieties of Ravioli already contain meat and a lot of flavour, they don't require complex sauces. Simple tomato sauce or butter, sage and parmesan suffice to dress these treats. On the 26th of December a special kind of ravioli is eaten "Ravioli di Brasato". The filling is made with the leftover braised beef from Christmas day mixed with egg and a few other ingredients. 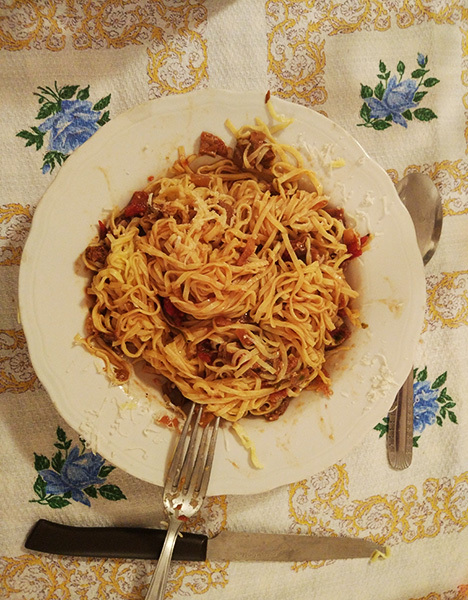 There are plenty of recipes online for how to make this but the hardest part is actually putting it altogether, the pasta making being much harder than it looks. Putting the dough together is simple: you need 400g of finest white flour (tipo '0' in Italian), mixed with 4 eggs a dash of oil and salt. Knead the dough until its well mixed, wrap in cellophane and put it in the fridge for an hour. Again, detailed recipes can be found online. 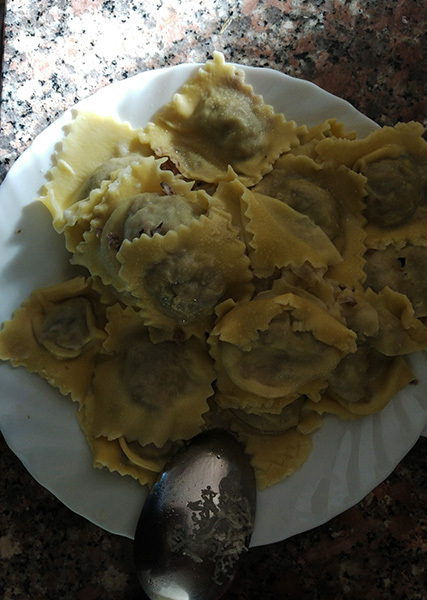 Ravioli are a popular post Christmas dish in Northern regions and this is because an absolutely delicious filling is made with Christmas meat leftovers. "Brasato" or braised beef in English is the Christmas day meal and since quantities are always vast, there's always a decent bit left over. This is chopped up, has egg and cheese added and makes a hearty meaty filling for the pasta. Look up online for detailed recipes. 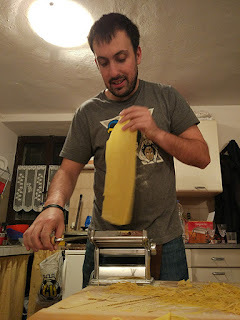 What follows are some observations I've made from making ravioli, specifically the pasta. Hopefully it will have some usefil tips/advice for your own endeavours! After an hour its time to start the production line. Roll the dough into a thick "snake" and cut off a finger-length piece. Flatten it out into a pancake shape with your hands and then put it through the machine. I put it through 4 different thicknesses, going from 1, 2, 5 and 6 (the thinnest). Once its the desired thickness make sure its wide enough and long enough to fit over the ravioli mold. If its too short, you need more dough, work out how much you need for the right amount so next time you don't do this again! If its too narrow, fold it in half and run it through the machine again at the desired thickness, this will fatten and flatten! One problem of running the dough through the machine is dryness. The more you flatten it, the drier it gets. Try to get the strips through as quickly as possible. This also goes for the dough. In a warm room, the dough starts drying out making it hard to flatten and control. Keep it in cellophane and put it in the fridge while you're not using it. If the dough does start to dry out, your only solution is to add tiny amounts of water while kneading it again. A lot more effort and time wasted. So don't let it dry! The next issue was the filling. Since you're using a mold, too little means empty space that can fill with water from the cooking. Gross. Too much means they'll break. Ruined. You need to be consistent with the quantities so use a spoon to measure. Push the filling gently down into the mold, deep enough so it doesn't spill over and out of the hole. If it does, it means that the ravioli might not seal properly and fill with water. Gross and ruined. Once the first layer of pasta has the ravioli filling on/in it. Wet around the edges of each ravioli with fingers or a brush and a tiny splash of water to moisten the dough. Put the second layer over the top, pushing it gently so it sticks onto the under-layer. Using a small rolling pin (probably provided with the mold)seal the ravioli together with powerful, controlled short thrusts pushing downwards so the ravioli are cut at the seams and sealed around the edges. Hopefully the ravioli will seal and can be peeled out of the mold. Obviously you're not going to make enough ravioli in one go, so you need to put the finished one somewhere. Be very generous with flour here. Put a lot of flour on the surface where you will put them. Put them on the floured surface trying not to have them touch. If you are putting them on top of each other, I don't recommend it, but space is always an issue, so if you put them on top of each other, cover the first layer of ravioli in as much flour as possible. If you don't use enough flour, the ravioli will fuse together or stick to what you're keeping them in. When you peel them off or apart they will break. 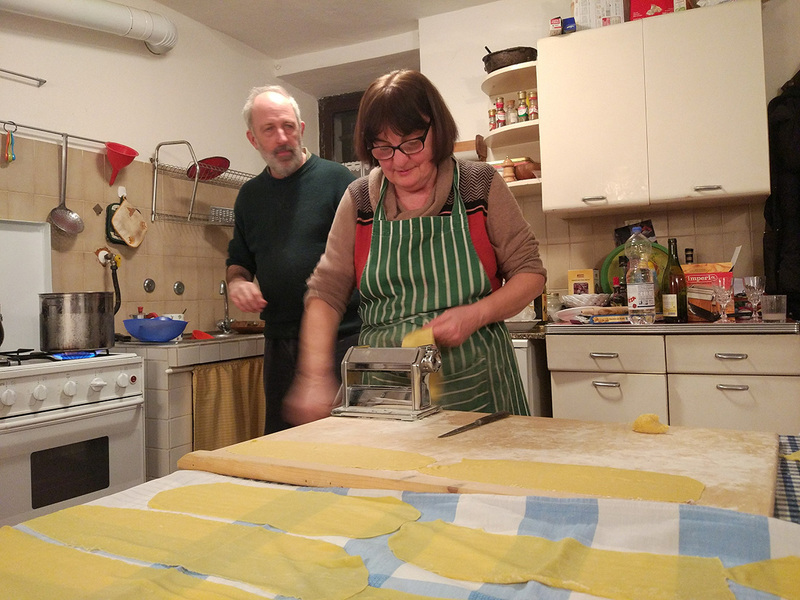 Ravioli are very satisfying to make and can be a really filling and delicious meal. If you are careful they are not so hard to do, but give yourself lots of time and the most important things to avoid are dryness and them sticking together when you store them! Oh yes, and any left over pasta? Turn it into Linguine!